Vladimir Putin took the oath of office Monday for his fourth term as Russian president, promising to pursue an economic agenda that would boost living standards across the country. 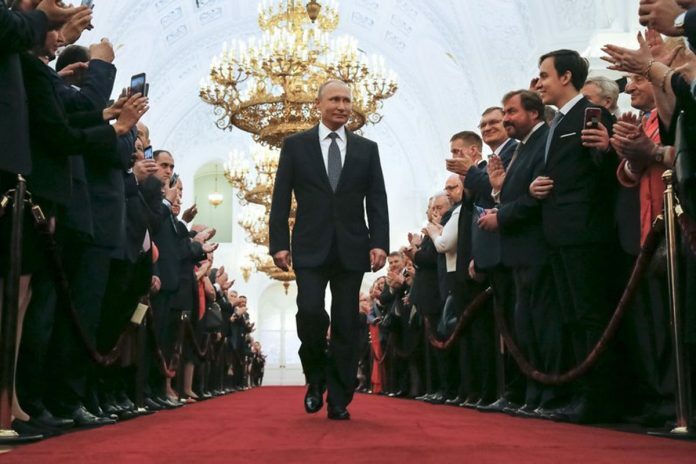 In a ceremony in an ornate Kremlin hall in Moscow, Putin said improving Russia’s economy following a recession partly linked to international sanctions would be a primary goal of his next six-year term. “Now, we must use all existing possibilities, first of all for resolving internal urgent tasks of development, for economic and technological breakthroughs, for raising competitiveness in those spheres that determine the future,” he told thousands of guests standing in the elaborate Andreevsky Hall of the Grand Kremlin Palace and two adjacent halls. “A new quality of life, well-being, security and people’s health — that’s what’s primary today,” the 65-year-old leader said. Although Putin has restored Russia’s prominence on the world stage through military actions — including intervening in Syria’s war to help President Bashar Assad — he has been criticized for inadequate efforts to diversify Russia’s economy away from its dependence on oil and gas exports or develop the country’s manufacturing sector. Russia’s economy was hit hard by low world oil prices and sanctions connected to Russia’s 2014 annexation of Crimea and military involvement in the separatist uprising in eastern Ukraine, with the ruble losing half its value between 2014 and 2016. The country recorded an anemic improvement in 2017, with gross domestic product rising 1.5 percent and the ruble recovering some of its value. But the ruble dropped about 8 percent again last month in the wake of new U.S. sanctions. “Russia should be modern and dynamic, it should be ready to accept the call of the times,” he said. Putin held onto the presidency in March’s election when he tallied 77 percent of the vote. Putin has effectively been the leader of Russia for all of the 21st century. He stepped down from the presidency in 2008 because of term limits, but was named prime minister and continued to steer the country until he returned as president in 2012. He became acting president on New Year’s Eve 1999 following the surprise resignation of Boris Yeltsin and was elected to his first four-year term in 2000. The ceremony Monday was covered in assiduous detail on state television. It showed Putin working at his desk in his shirt sleeves, then donning a suit coat to begin a long walk through the corridors of the Kremlin’s Senate building, then boarding a limousine for a short drive to the Grand Kremlin Palace. Thousands of guests stood in the three halls for the inauguration. One of the most prominent was former German Chancellor Gerhard Schroeder, who is now chairman of Russia’s state oil company Rosneft and one of the most prominent Western voices arguing for an end to sanctions against Russia. Schroeder stood with Prime Minister Dmitry Medvedev, and Putin prominently shook hands with him after the speech. Soon after the ceremony, Putin issued an order formally dissolving the Cabinet but nominated Medvedev to serve again as prime minister. The lower house of parliament is to vote on whether to approve him on Tuesday. It wasn’t clear when other ministerial posts would be decided or if significant ministers might be replaced.